A love story for bright summer days. Hand drawn animation, projection mapped to the walls of São Paulo, then shot with an SLR. Nice and inspiring work. Only complaint would be about the background music. We can mute this and play our faves instead, the video is not tightly edited to the sound. Kyle Evans performs on a CRT-TV-housed Controller with innate visualisation capabilities. This built is an open-source project, info and tutorials on hacking CRTs can be found on crackedraytube.com. 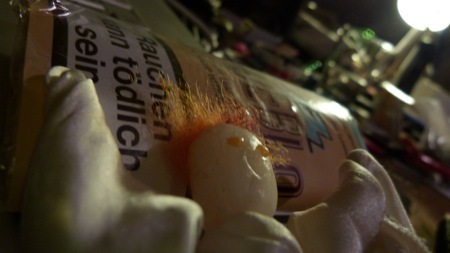 Documentation of this specific project is still in progress. In the meantime visit Evans de/Rastra-project-page on this. Out of the Box Vol. XII coming up! 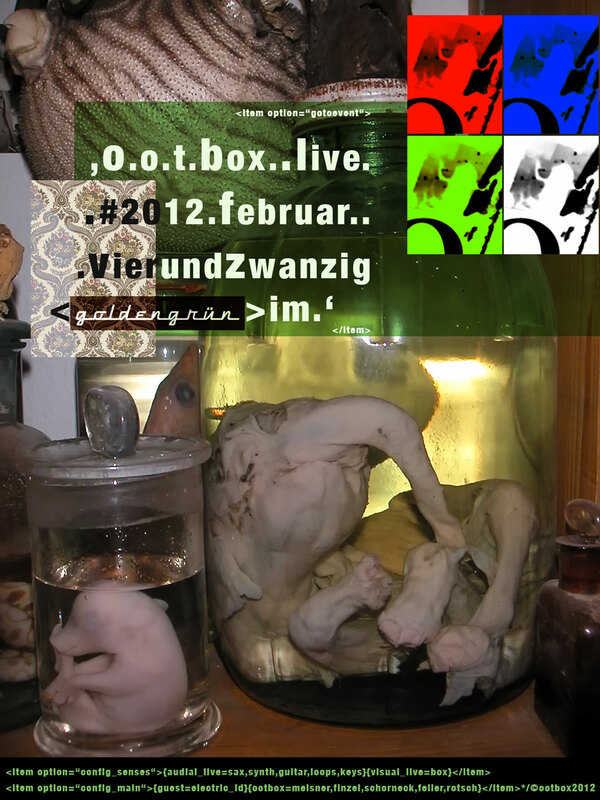 We are happy to announce Out of the Box’s first gig in 2012. The Out of the Box audiovisual experience will goosebump your cerebral cortex for the eleventh time at a phenomenally styled but totally unpolished, great tiny venue called goldengrün (right, goldengreen that is). Check their nice Website for Information and Inspiration. The cute old-school-wallpaper-style is what you should expect from a visit. As long as you are not so much of the faint-hearted kind, this visit should must happen next friday, period. Adress below Flyer or on the forementioned website goldengrün.de. Starting time is possibly much later, please expect us to lighten up our box for you at 22hours. Guest is two persons this time, electric_id will cramp themselves behind the front-screen of our box with us. In case you are of the faint-hearted, but managed to get through this post somehow, we recommend the day after friday (which is saturday) to go off the air with Funk’n’Soul DJ Señor45. Saturday, 25.02.2012, same place. Out of the Box Vol. X is the last episode of season one. This is the last chance to experience the old-school Out of the Box performance at 1st floor, Medien-Bunker Marxloh, on FRIDAY, 25. NOV. 2011.
the OUT OF THE BOX audiovisual experience Vol. IX at Beat im Bunker will feature Tim Heinrich (orchestral) and take place on Sept. 30 2011 at 1st floor – Medien-Bunker Marxloh. Our Out of the Box website has matured and will be launched soon, alongside with a blog in german language. Expect them to go online within two weeks, announcement will follow. The mentioned website will offer periodic releases of audiovisual live recordings for free. In advance of the actual site, we now present our first release, an excerpt from Out of the Box Vol.III from Sept.30.2010. LIVE: the OUT OF THE BOX audiovisual experience #3.1 from Visualitätenkabinett Erika on Vimeo.